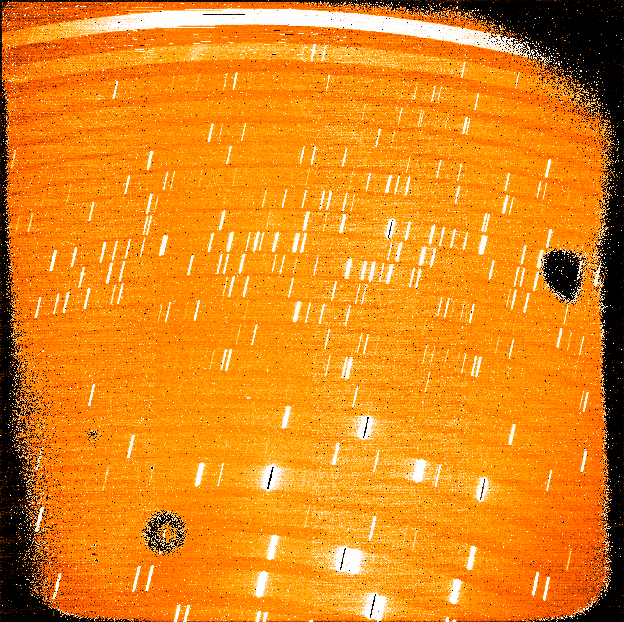 Today we obtained our first lab images with the Folded Port Infrared Echellette, or FIRE, spectrograph. This instrument is being built by Rob Simcoe, myself, Paul Schechter, John Bochanski, Jason Fishner and Matt Smith at MIT; Criag McMurtry, Judy Pipher and Bill Forrest at U. Rochester; and Rebecca Bernstein and Bruce Bigelow at UC Santa Cruz. FIRE is a near-infrared spectrograph that will be installed at the Magellan Telescopes, Las Campanas Observatory, hopefully in January 2010. This week was the first time we had (nearly) all of the components inside the dewar, evacuated (to <10-5 torr) and cooled (to 100 K) in order to test whether we could actually get light onto our engineering grade detector. To our happy surprise, our first images detected the light of a flat field lamp and, after some fairly minor focus adjustments, we were able to get flat field and arc lamp light across the entire detector. So much for the 2 months planned for optical alignment! 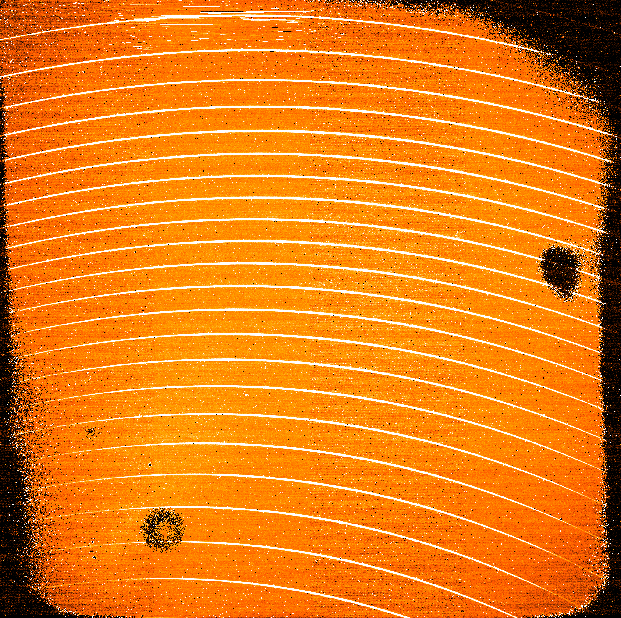 Flat field lamp exposure with the 0.4 arcsecond slit. This is a single read image as the lamps saturated the detector on the software's standard 10 sec correlated double-sampling exposure. 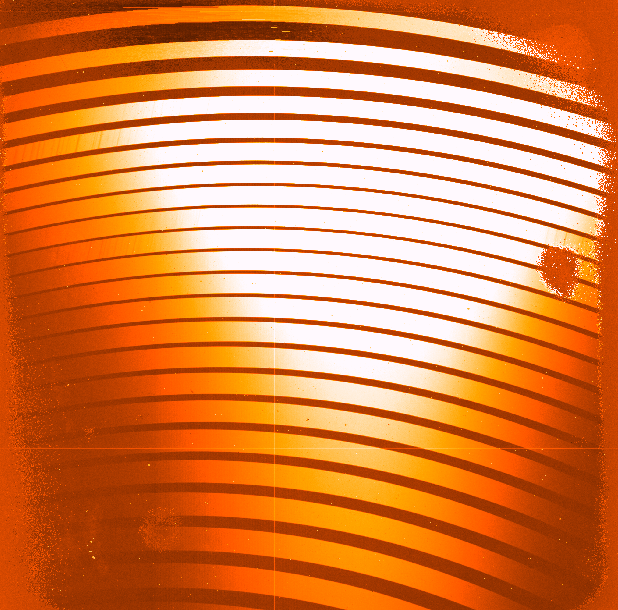 Flat field lamps exposed through the pinhole slit, showing what a typical source spectrum might look like. The dark regions are defects in the engineering grade detector; our final science detector will be much cleaner. 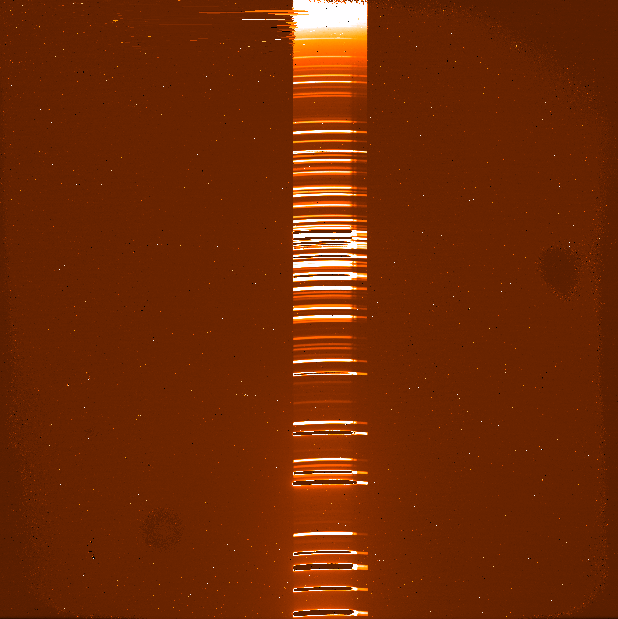 Argon arc lamp exposure through the 0.4 arcsecond slit, showing the lines scattered across the various orders. Argon arc lamp exposure in the prism-dispersed mode, which is lower resolution but covers the same wavelength range at much higher throughput and has a wider (1 arcminute) slit. There is some vignetting due to the slightly offset position of the mirror folding lamp light into the instrument. What is the FIRE spectrograph? FIRE is a moderate resolution (λ/Δλ ≈ 6000, Δv = 50 km/s for the nominal 0.6 arcsecond slit width), cross-dispersed, near-infrared spectrograph, meaning that we get full 0.85-2.4 micron coverage in a single exposure. Its design is a balance of sensitivity for faint targets and sufficient resolution to split telluric OH emission to measure quasar absorption lines and stellar radial velocities. It will be installed at the Magellan Telescopes, with commissioning planned for January 2010. You can read more about the science case for and design of FIRE at the FIRE webpage. Why do the images look so rough? The array we are using (a Hawaii 2RG from Teledyne) is an engineering grade array, and will eventually be swapped out for a better (and more expensive!) science grade array. This array will be used as a slit-viewing camera for acquisition and guiding. Why are these images so important? Bringing the instrument to this stage has been a 3+ year venture, with many custom components – software and hardware – being built just for this instrument. 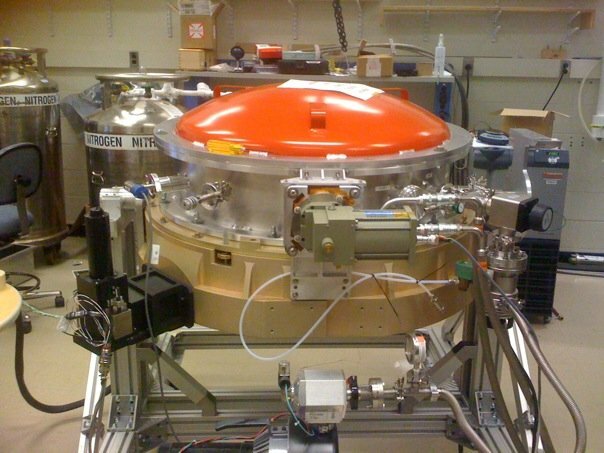 A lot of things had to go right just to get any images: the vessel containing the instrument (the dewar) had to be successfully evacuated and cooled (i.e., the plumbing had to work); the various mirrors, prisms and lenses had to line up after cooling by almost 200°C; the new detector, new control electronics and new software all had to work (the latter was a bit titchy but we’ll have better soon); and most importantly the design had to be right. So we were frankly amazed that the pictures turned out at all! Plenty! We need to address some cooling issues (it took nearly 2 days to bring the detector down to 100 K), install the science grade detector, install the slit viewing camera, finish the control software, make sure all the motors are hooked up and communicating with the control software, put all the electronics together, install and test the final calibration unit, ship the whole thing down to Chile, install it on the telescope, test it on the sky and run the hell out of it to make sure it works, finish the reduction software….and then you can use it! Wow, what a cool instrument! Can I get some swag with the FIRE logo on it?